Meet Your Neighbor Dianne Kircher of Stronghurst. 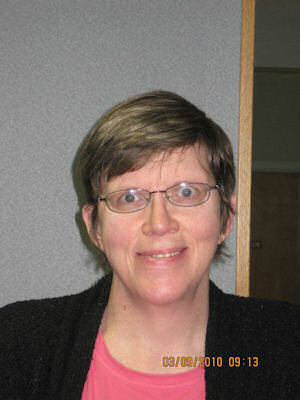 Dianne has been employed at Oak Lane Nursing and Rehab as Office Manager since November of 2006. She is responsible for accounts receivable, accounts payable, Medicare and various office duties. She was born in Quincy and raised on a farm near Loraine. In 1973 Dianne graduated from Unity/Mendon High School. She then continued her education at Gem City Business College in Quincy where she took junior business accounting courses and graduated in 1974. She also took several computer classes and a tax course at Quincy. Her parents, Edith Cameron and Richard Kircher are both deceased. She has 3 brothers, Brian (Kathy) Kircher who live in Mendon and are the parents of Jacob (19), a student at the University of Illinois in Champaign. Brian is a rural mail carrier for Golden and Kathy is employed at County Market as a graphic artist in Quincy. Her second brother, Brad (Janet) Cameron live in Warsaw. They have two children, Brittany (21), a student at Quincy University and employed at Blessing Hospital and son, Nathan (11). Brad writes sports stories for Gate City News in Keokuk, Iowa, and Janet is employed at Du Pont in Fort Madison, Iowa. A third brother, Jason (Tea Ann), Cameron live in Warsaw. Jason drives for Kohl's Food Distributors in Quincy and Tea Ann is an RN at Blessing Hospital in Quincy. They have two sons, Vance (7) and Vaughn (5). Dianne attends the United Methodist Church in Stronghurst where she serves as one of the lay liturgists. She said, "I serve wherever they need me. I started on Sunday, March 14th, speaking at the Kirkwood United Methodist Church for 3 Sundays, 5 hours on each Sunday. After that I will receive my certification as a lay speaker." "For enjoyment I teach a Bible study for the residents of Oak Lane, attend a couple of other Bible studies, am involved in the Walk to Emmaus, being on teams and speaking. I have helped on teams with Chrysalis (teen program), and was also on teams with Journey (college age)." When asked what she liked most about Oak Lane she said, "The family atmosphere. The residents and employees are nice and good to work with."